I am a firm believer and solely practice classical education in our home. At every conference I attend I am reminded that I am teaching my children the process of learning. I am convinced that with the Classical model you can learn anything, without the structure of formal education. Grammar, Dialectic, and Rhetoric that's all you need for any subject. In my own life, if I so strongly believe these methods then I will use them to attempt to learn some thing new. Crochet. Grammar Stage: I found an expert (my aunt) and she gave me a hook and a magazine that had patterns and pictures of each stitch with its corresponding abbreviation and I went home ready to make something wonderful! Isn't that how it always is when we teach our children something new we expect them to grasp it in the full way we have and come to a mountain top experience. This of course didn't happen. I spent a month trying to get the basic stitches down, getting so mad sometimes I would throw the thing across the room and not pick it up for 2 days. By the end of the month I was ready to make something, and did manage to make a scarf for a friend's birthday. 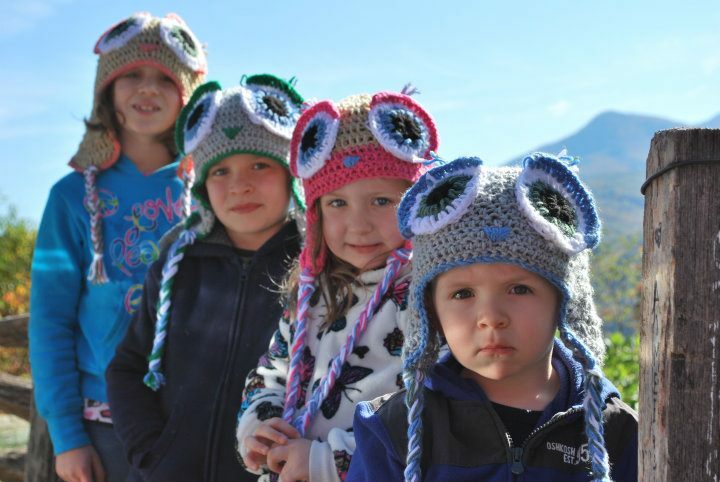 Now for those adorable little owl hats that would be perfect for the fall on my little munchkins. I followed a YouTube tutorial for almost 4 hours one afternoon, and I had it!! Here we are posing with the fall colors of the Great Smoky Mountains. I love Jude's "crabby" face in this one, it is such a put on! Dialectic Stage. I have continued to analyze my work and process what I am doing wrong and where I might improve. And most importantly I am practicing, practicing, practicing. Here's take two! 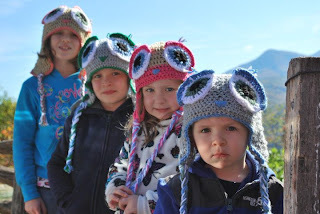 A monster hat to send to my niece for Christmas. I really am proud of this one. I looked at a hundred on Etsy to choose the design I wanted and then I figured out how to do it by myself. Don't they say third times a charm? Now I am working on critters for all the kids: a horse, a unicorn, a robot, and a dinosaur. I am really excited to reveal them!